Horsey Beach at Horsey BeachAt Horsey, the Broads reach out to the North Sea. Access to the beach at horsey is on foot from Horsey Mill and village (about 1½ miles / 2.4km) or via a track to a small car park at Horsey Gap. At Horsey, the Broads reach out to the North Sea. Access to the beach at horsey is on foot from Horsey Mill and village (about 1½ miles / 2.4km) or via a track to a small car park at Horsey Gap. 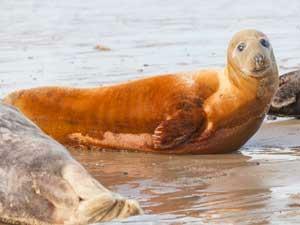 Grey seals abound on the sand dunes and beaches of Horsey and Winterton-on-Sea, mainly in the winter months.